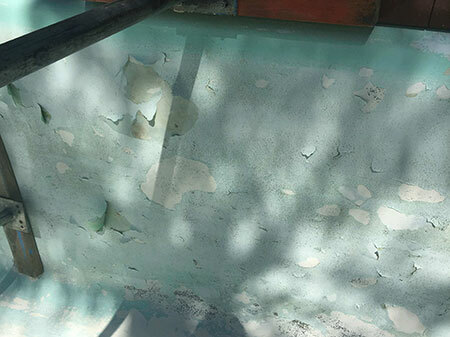 Does your fibreglass pool look like this? 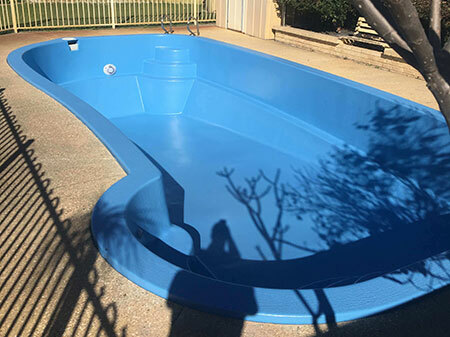 Perth Pool Co. is Western Australia’s leading professionals in fibreglass pool restorations. Using the latest AQUAGUARD™ Fibretech technology with Vinyl Ester resins, a new laminate shell is bonded to the existing structure. 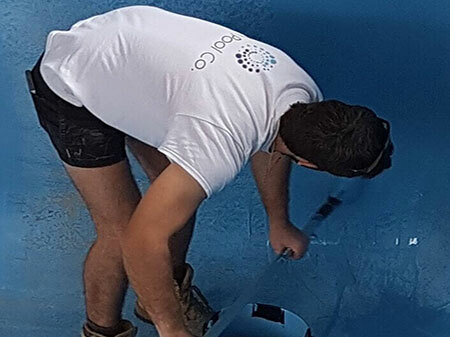 This method eliminates any bubbles, black spots, blisters, rust stains or fading colour and in turn provides a durable, long lasting surface barrier system which will restore and protect your swimming pool. 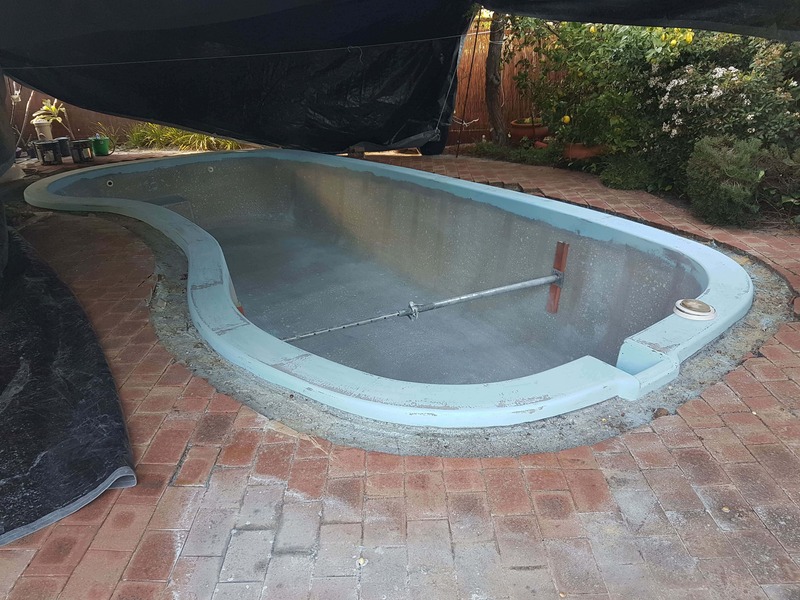 Prior to grinding, the pool is drained and braced with Acrow Props. These props support the stuctural integrity of the pool’s fibreglass walls. 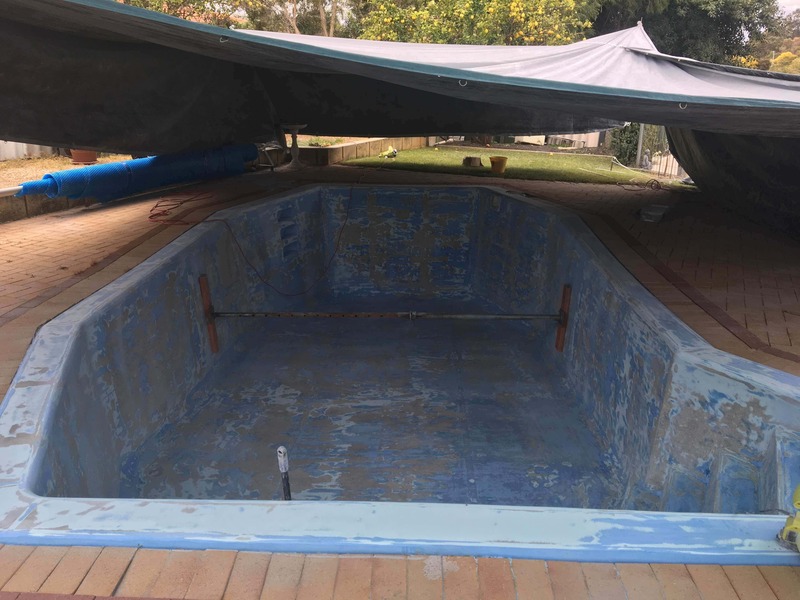 A large tarp is erected over the pool to assist with containing dust and fibres, ensuring a clean and safe work site. 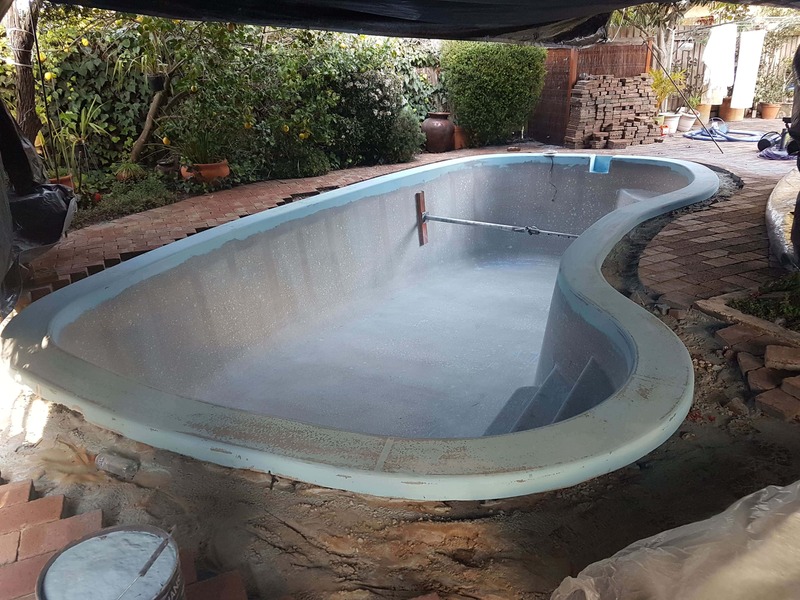 Once the pool has been braced and emptied the old Gelcoat is removed with our specialised grinders. The grinding process is very complex and can take between 2-6 hours to complete. 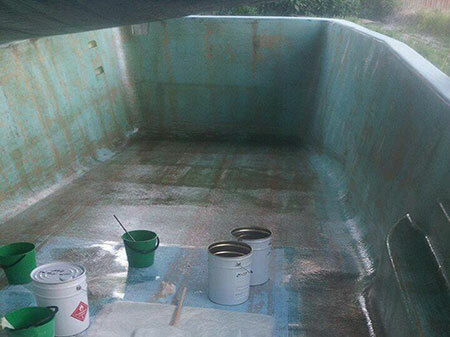 A Vinyl Ester resin primer is applied over the freshly ground surface. This primer is infused with the fibreglass, enhancing the strength of the next layer. A reinforced fibreglass laminate is then applied and bonded to the Vinyl Ester layer creating a robust fibreglass shell. Keying in the new laminate to the existing shell is critical and must be done correctly. This laminate and primer combination ensures superior chemical and water resistance along with the best strength available. This process is called the AQUAGUARD™ System. All our products are strictly created by Allnex Composites. Once the fibreglass has fully cured, a Vinyl Ester Fill Coat is applied. 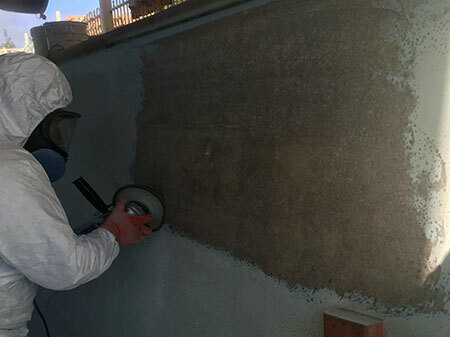 To ensure any small holes or imperfections possibly left after the fibreglass layer is removed, Fill Coat must be applied correctly. Not only will this create a smooth surface but also a secondary chemical barrier. The chosen colour pigment is added to the final Vinyl Ester Fill Coat as this will enhance surface finish quality to the following coat. Once the Fill Coat has cured, this layer will be lightly ground back to remove any imperfections in preparation for the Top Coat. The Top Coat contains pigments and Styrene Wax. This needs to be applied carefully and according to specification. This coat will protect the colour from fading. 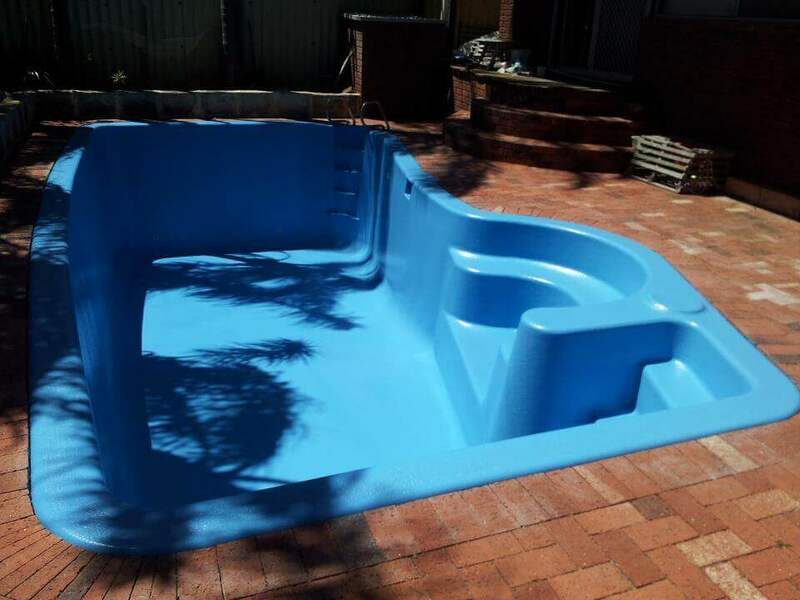 ​This coat also contains a colourful, decorative and protective barrier for your swimming pool. 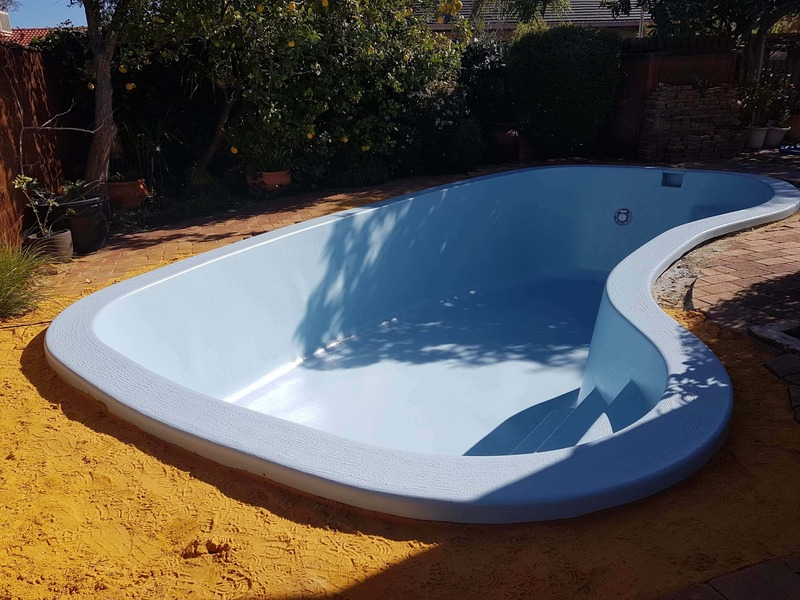 The result… A spectacular pool with superior quality! 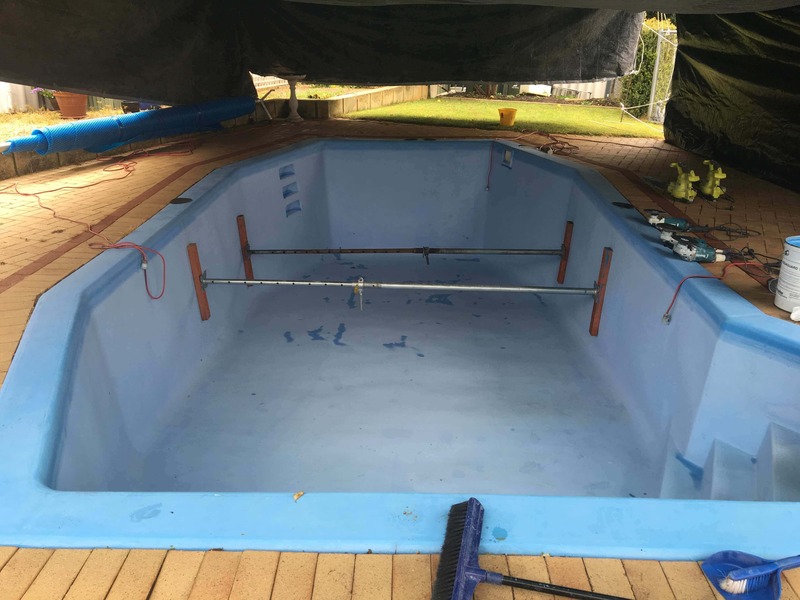 Trust Perth Pool Co. to resurface your fibreglass pool today.